All trains to and from London King's Cross have been cancelled because of overrunning engineering. Network Rail said the work near the station was part of a £200m Christmas investment programme and described the move as 'regrettable and unfortunate'. Operators intend to run services into other stations but watchdog Passenger Focus said it was 'frustrating'. The Department for Transport said it would have talks with Network Rail about the 'disappointing' delay. East Coast Trains said passengers would need to start or finish their journey at Finsbury Park in north London, with at least one change of train. 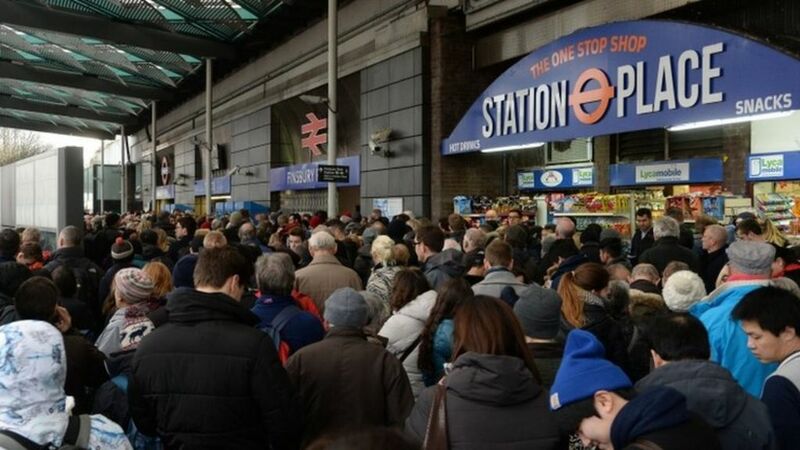 The Office of Rail Regulation launches an investigation into major disruption to passengers caused by overrunning engineering work at two London stations. With heavy rain falling over North London on 23 July 2005, a Hull Trains service accelerates through Finsbury Park on the down ECML shortly after leaving Kings Cross. Meantime, in the left background, construction work continues on Arsenal FC's new Emirates Stadium. Platforms 1 to 4 at Kings Cross are unusually devoid of stock at 18.45 on 4 December, with only the lights of the Thunderbird class 67 stabled in the siding beyond the platforms visible. Facade of Kings Cross station on 24 July 2014.